'Times Of India' reported two separate incidents which were shocking revelations of a wildlife trade going unabated despite regulations and laws. The first one was about an Air-India employee being arrested by the customs department along with 100 kg peacock feathers while attempting to smuggle them into HongKong. The second, equally shocking, was the seizure of feathers of 105 birds from four packages bound for the US and Japan. These belonged to the grey jungle fowl ( Gallus Sonneratti). This is the first time that customs department has seized feathers from postal packets. It seemed apt that World Pheasants Association (WPA) should hold a workshop on 'Saving the National Bird' at India International Centre on 29th July 2002. The program began with the screening of 'Sarang the Peacock' a short film by Dr. Susan Sharma, founder of IndianWildlifeClub.com. The distinguished panel consisted of Shri Samar Singh, President, WPA India, Shri S.C Sharma, DG (Wildlife), Ministry of Environment and Forests, Prof. A H Musavi, General Secretary WPA India and Dr. P.C Chowdhury, Scientist, Wildlife Institute of India. Dr. Musavi: Stressed on the ecological role of peafowl-its importance in pest control, droppings as manure, flora growth by digging etc. Compared to, say a green pigeon which feeds only on wild seeds, the peafowl with its wider eating habits has a more complex role in the health of the eco system. Dr. P.C. 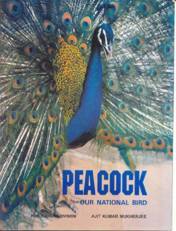 Chowdhhury: Lamented the lack of research papers on the peafowl. Commercial exploitation of feathers of the male of the species is the bane of the bird. Since the bird is polygamous, there is bound to be a decline in genetic viability. Mr.S.C Sharma: The attitudinal change in people, viz. non tolerance of birds and animals is a growing threat. He suggested the film on peacock should be made available in villages too to revive the age old harmony of nature and people which has been the secret of wildlife conservation in India. Enforcement of wildlife laws are important. He felt that protecting by benign neglect is the best form of conservation-domestication/farms etc are not the answers. Our first attempt at online chat on 17th July 2002 marks a great step forward for IndianWildlifeClub.com- another step towards 'adapting the latest technologies to spread the message of conservation and environmental education'..
A transcript of the session is given alongside. Do log on to this month's chat on 18th August. Susan: Hello This is Susan. Anyone out there? kunaal: What is going to be the focus of today's discussion? Susan: The focus will be environmental issues in our country. Susan: But you can ask general questions about wildlife/national parks etc too. kunaal: What is going to be the effect of poor monsoons in the northern part of India, if any, on the wildlife in these sanctuaries? kunaal: I wonder at the sad state of affairs in our so called 'National Parks' and 'Wildlife Sanctuaries'. Do our laws ever get implemented? kunaal: Is Mr Mahendra Vyas online? Susan: yes, he is sending the replies to your questions.soon. Susan: Sorry about the delay. Hope we will improve next time. Thanks anyway for coming. Mahendra Vyas: Welcome all of you. Shoot! Thank you. I am waiting for questions. Pl. shoot! Thank you Susan. Are you reading me???? Kunaal do you have any questions ? Thank you again Susan. I am waiting for some questions !! Kunaal we have a very large man and cattle population in this country yet we have more than 500 national parks and sanctuaries to boast. Some of them are truly spectacular. We do have some problems - many of our national parks are not fully notified. The rights of the people have not been acquired even after 30 years of their first notification. These areas are full of timber which is very valuable. The mafia are united - the resources are limited yet there are many dedicated officers and staff battling it out to save our precious natural heritage. I am right here. If monosson fails - I hope it does'nt- the Proteceted Aeas (PA's) worst affected will be in North Western Regions. Sariska, Ranthambhore, Wildlife found in Western Rajasthan eg. Chinkara, Balck Buck etc. I am reading you now Susan. Susan: Sorry for interruption, the server is ok now . Susan: Looks like monsoon has arrived in Rajasthan finally. That is good news. Mahendra Vyas: If the rains fail- Wetland /bird PA's would be the worst affected in the North and North Western region. If it fails elsewhere the wildlife in these regions will have a tough time. Mahendra Vyas: I am happy - my state which gets the least of the rains has got some. Mahendra Vyas: The prey species such as the sambar and cheetal may skip breeding and there will be very few fawns born. Mahendra Vyas: If the population of prey species fluctuates it can have some effect on the predators such as th tiger. But nature has its way of controlling and balancing. Susan: Birds can always fly off to a place where there is rain. But animals which do not migrate will suffer I think. Mahendra Vyas: They can fly to some other place - but not all the birds do that- many are territorial and do not leave their home range and continue to face the challenges. Other birds such as the storks, herons, ducks and teals, cranes, great Indian bustards migrate to greener or wetter areas for breeding. Mahendra Vyas: Then one has to look at the regeneration of the forest, grassland and vegetation in general. Without rains this will not take place. Mahendra Vyas: We must also remember that only the fittest will survive. In adverse conditions the weak will perish and the fit and the strong will survive and leave behind stronger and resilient individuals in any population. Susan: Thank you very much for the stimulating views, Mahendra Vyas. I wish more people had logged in. r-agarwala: is the chat still on? Susan: Hi welcome Rajyashree. MVyas will be happy to field your questions. Mahendra Vyas: Hi r-agarwala! Hi Rajyashree!Welcome. Shoot! Susan: I think we will wait for ten more minutes before calling it a day. MV, please stay online. Susan: Thanks for coming back. r-agarwala: Are we doing something to maintain this region and its fauna? Mahendra Vyas: Ladhak region has a few protected areas where the wildlife and its habitat are protected. Susan: What are the endangered animals of this area? Mahendra Vyas: r-agrwala-let me inform you that the Wildlife Institute Of India, Dehra Dun is doing lot of surveys and research in this areas - on snow leopard, bharal or blue sheep, Himalayan tahr, tibetan wild dog and T. Wolf. Mahendra Vyas: More PA's would be set up after completing the surveys in this area. r-agarwala: I see...the aim of the surveys being? Mahendra Vyas: Yes. Tibetan antelope or chiru is one susan. Mahendra Vyas: All other animals I mentioned earlier are also rare. r-agarwala: there is very wide variety of birds there too. Mahendra Vyas: Yes! The most spectacular is the black necked crane. The Brahminy Ducks breed in the Himalayan lakes such as Mansarovar. The Great Crested Grebe is another large interesting bird. Tibetan snowcock , pigeons, seed eating birds such as buntings and larks abound. The highest flyers- the yellow billed chough (crow family) has been seen almost on top of the Everest. The large bar headed and the great lag geese also migrate thru this region and breeds in some lakes there. Mahendra Vyas: Shall we sign off? Susan: I think we have exceeded time already. Thanks a lot. Susan: Rajyashree thanks a lot. Leh discussion was really interesting. Mahendra Vyas: Thanks friends. I am signing off. Till we meet again. Bye. A healthy civilization can only be one that harmonizes with and integrates into the totality of life, enhancing not demolishing it.